We exist to share this beautiful corner of Iceland with you, with all its wonderful land and seascapes, its many opportunities for adventure and the generous hospitality of the people that live here. We're now in the 4th year of running unique wilderness trips, researching old animal herding and walking routes between Ísafjörður and Látrabjarg, gaining funding to carry out landscape conservation work and dreaming a way forward for the project to bring benefit to the land, local people and visitors. The project began as a dream to connect people to nature through long-distance walking experiences, and for it to contribute to the land's conservation and sustainable development. 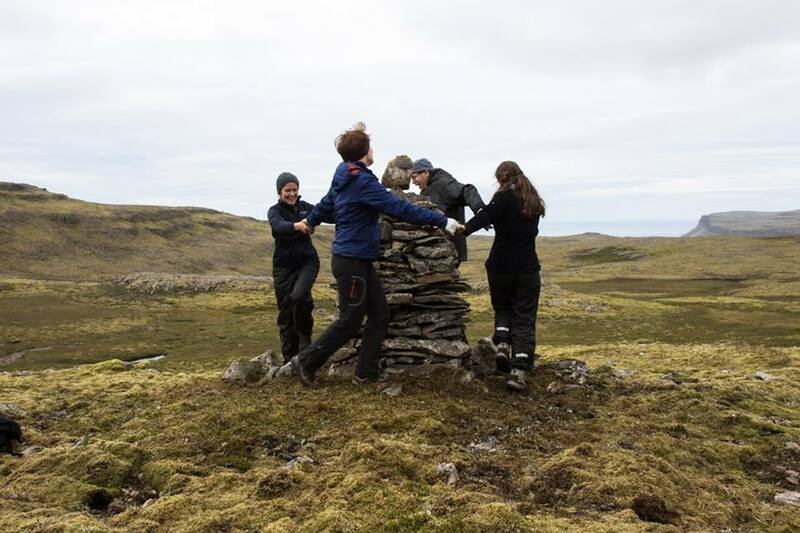 Early funding success allowed the project to prototype and run different trail experiences and also conduct research into possible walking routes between Ísafjörður, in the North of the West Fjords, and Látrabjarg in the South. The route we've identified between these two points is +/- 200km; an outline is shown on the map below. Blue lines are water crossings by kayaks or rescue service boat. The rest are walking routes. Further funding success was achieved in 2015 to carry out cairn restoration work along the identified trail and to plant 10,000 trees at Hfranseyri. More information on these project activities can be found here: 'Reports'. These actions have enabled us build an environmental narrative around the trail through direct conservation action, cultural landscape restoration and by offering creatively faciltated wilderness work-camps. Work continues to create a trail resource that local companies and visitors can make use of. This resource is likely to a printed publication showcasing the trail and options for experiencing it, along with further development of this site. If you'd like to find out more about this, please get in touch. We've experience nature as a source of inspiration, creativity, challenge, sensory richness and value the opportunities it provides for soul-level engagement. The experiences we offer are therefore designed to give something back to the land and communities existing here, to connect you to the elements, and to deepen your appreciation and understanding of wild space. Prior experience isn't required for this; we've had people who've never camped before join us for 2 weeks of wilderenss walking and camping! We will take exceptional care of you and sensitively manage your expectations and experience from start to end. The different practical and theoretical disciplines we draw upon reflect our holistic perspective on ecology, where there exists continuity, not division or separation, between humanity and nature. These include: storytelling, foraging and cooking, working with stone (cairn restoration), tree planting, swimming, wilderness walking and camping, walking with pack-horses, outdoor education, deep listening, experiential learning, eco-psychology, traditional healing systems and just taking time out to be still, listen and respond! We warmly invite you to be part of this process; please see '2018 Opportunities' to get involved.